BLACKFIRE Instant Detailer is a supercharged blend of Ivory Carnuaba Wax, Wet Diamond polymers, and high lubricity cleaners.� This shine-boosting detail spray instantly revives a dull finish and reactivates existing wax. BLACKFIRE Instant Detailer looks best over Midnight Sun Paste Wax but it is compatible with all waxes. Use this incredible spray to maintain BLACKFIRE's trademark �Wet Ice Over Fire� shine or over your favorite wax or sealant. The shimmer of fresh wax fades quickly, even though the wax is still there. Dust and dirt settle on the paint while bugs and birds do their parts to diminish the shine. What you need is a way to recharge and supercharge the existing wax and renew the gloss. 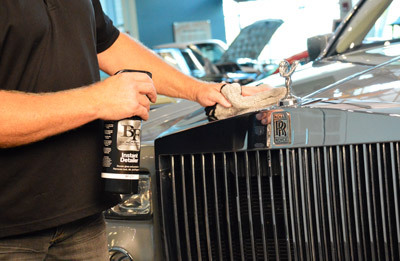 You need BLACKFIRE Instant Detailer! BLACKFIRE Instant Detailer is a high lubricity spray that loosens dust and light contamination so it wipes away without scratching.� You can use it to remove dust, dirt, fingerprints, smudges, as well as fresh bugs and bird droppings. High gloss Wet Diamond polymers bond to the existing wax to breathe new life into it and Ivory Carnauba wax intensifies the liquid shimmer. In an instant, the paint looks shinier, deeper, and more reflective. BLACKFIRE Instant Detailer buffs out easily and leaves a streak-free shine, even on dark colors. Enjoy the satisfaction of a just-waxed vehicle any time, instantly! BLACKFIRE Instant Detailer gives wax the boost it needs to go the distance. Shake well BLACKFIRE Instant Detailer before use. Mist one panel at a time and use a soft, clean microfiber towel to wipe off dust and dirt. Flip the towel and buff to a deep shine. Related Items - BLACKFIRE Instant Detailer 32 oz.